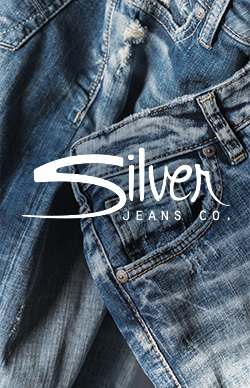 Here at Silver Jeans Co., we know that denim is a year-round essential, no matter the season. So for those hot summer days when your favorite jeans just won’t do, try our denim shorts. They’re designed with the same quality and detailing you love, but offer a little more freedom and mobility. They’re perfect for that time of year when you’re living a more casual lifestyle, whether you’re spending the weekend at the beach or simply enjoying the summer heat. If you’re looking for a short that’s easy and relaxed, then Zac is for you. It’s designed with extra room in the hip and thigh for the perfect mix of comfort and style. For a classic pair that’ll never go out of style, try one with a true blue indigo wash and natural distressing and whiskering. Of course, all of our jean shorts are constructed with the classic heritage denim you love, which features just a bit of stretch for a laid-back, comfortable feel. Finished with signature five-pocket styling and stitched details, you’ll wear them through spring, into summer and beyond—they’re the ultimate warm-weather essential.